It's not everyday you find a luxe, golden version of one of your favorite elementary school pass times. Scrawny little letter beads sprawled across the playroom floor for you to pick and choose any combination of letters to spell B-F-F-L or I-<3-U or even your name spelled out like I loved to do, M-U-N-A-C-H-I. You and all your friends strung each little bead on a string and tied each little knot on each thin wrist to prove your everlasting friendship with the bestest bracelets ever. 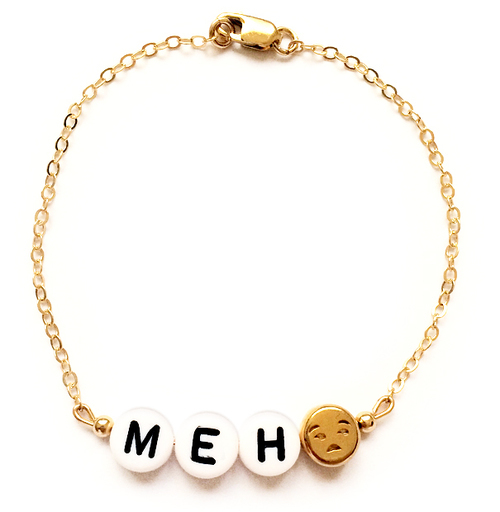 Now flash-forward to present day when all of the little girl memories are brought back to life with Ryan Porter's range of beaded letter bracelets in either gold (as seen above) or in the tradition white background/black letter combo. With your choice of a gold, neon pink bright blue, fluorescent yellow, or bright green chain or chord you can come up with hundreds of bracelet designs to gift you and your closest pals. What was once a sign of youthful glory days is now the coolest piece of jewelry sitting on your dresser.